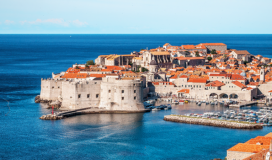 Dubrovnik, Croatia, the ‘Pearl of the Adriatic’, is situated along the stunning Dalmatian coast. 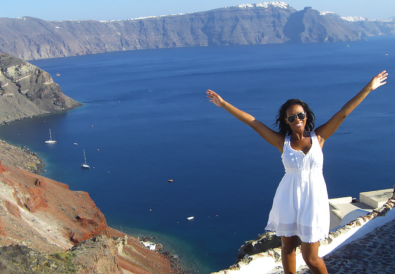 If you’re lucky enough to visit, you’ll want to get the most out of your trip and maximize your time. I’m not here to tell you whether you should “slow travel” or “fast travel” (if that’s a thing). I’m just here to tell you what you can see, do, and eat in 72 hours. Fortunately, that’s plenty of time to explore. 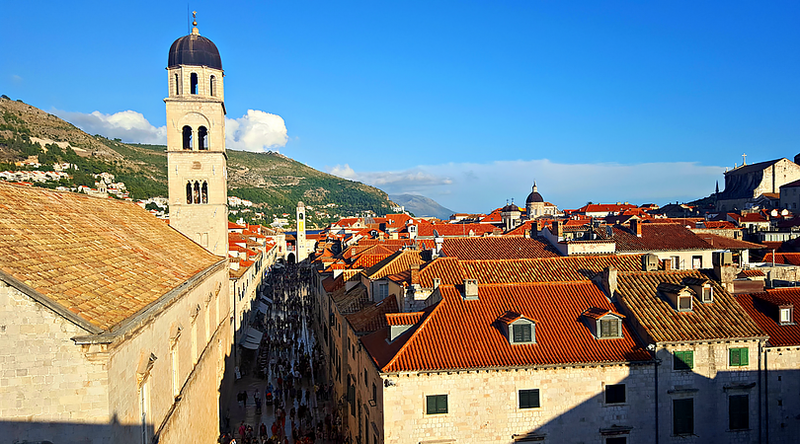 So, what can you do in Dubrovnik in 3 days? If you’re just arriving in Dubrovnik, you should read my original post on what to see, do, and eat in Dubrovnik in a Day. You can cover a lot of ground in 24 hours like walking the City Walls, taking the cable car up to Mt. 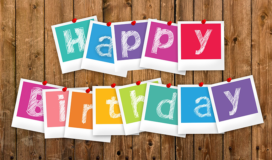 Srd, and so much more! Since you have more time, you can do these activities over a few days. 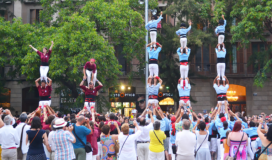 Just don’t miss a thing in Old Town, the stunning UNESCO World Heritage Site. Now, let’s start with day 2 of Dubrovnik in 3 days! Since you spent most of day 1 in Old Town, get out and see more of the city and surrounding islands. 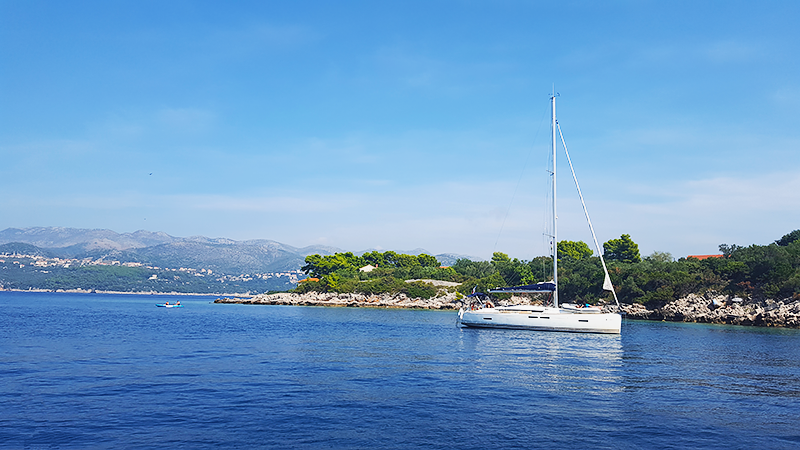 Plan a day of sailing with Dubrovnik Daily Sailing (book Maro – he’s awesome) and visit Mljet island, Elafiti islands, or stay close and go to the island of Lopud. 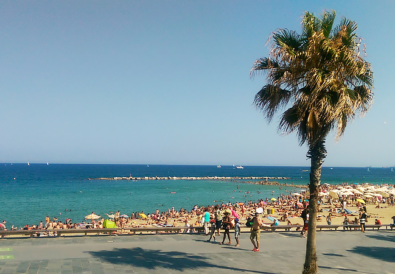 Our Experience: We booked a half day of sailing (4 hours) and went swimming at Sunj Beach. Who am I kidding, we stuck on foot in the water and said “nope!” It was way too cold so we, mostly me, stayed in the boat and took pictures! My hubby did get in the water for about 5 minutes but he couldn’t take the chill. After our swim, we walked around the island of Lopud, had a drink and some ice cream, and relaxed by the water. No matter what’s on your schedule for the day, you should definitely check out Piknik Dubrovnik. They’ll pack an unforgettable meal with everything you need from appetizers and the main course to dessert and drinks. 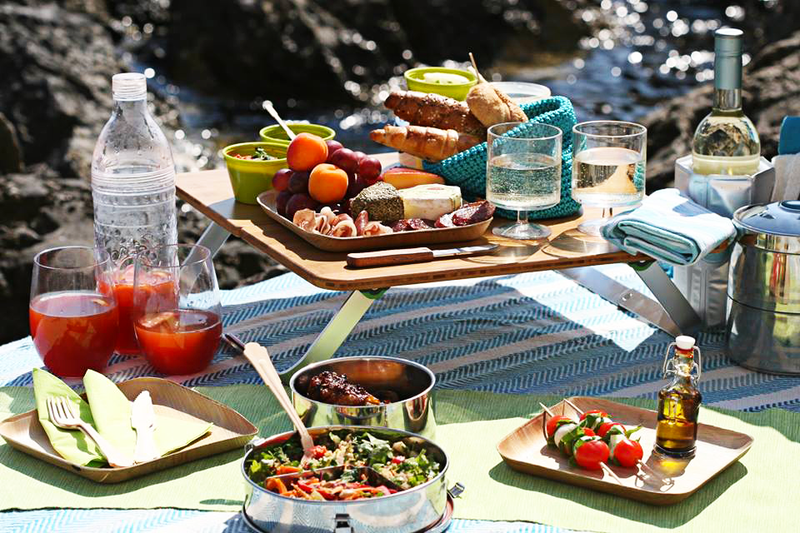 You’ll also have plates, utensils, a nifty tray, a blanket, and a backpack to carry it all in. 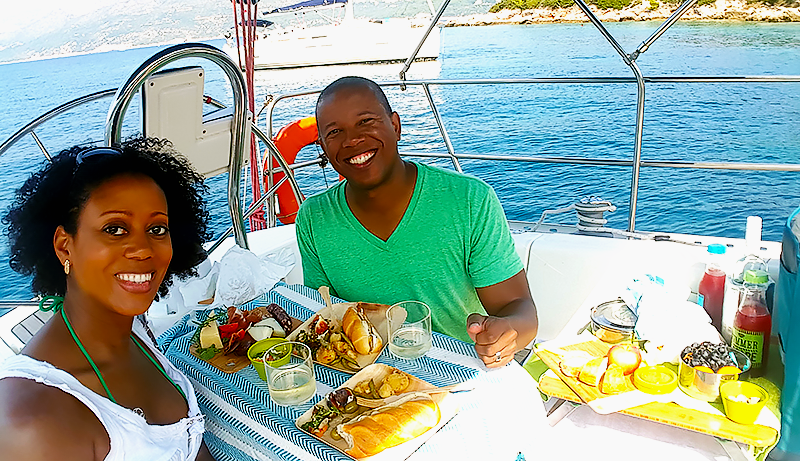 Take your picnic with you on your day of sailing and pick a spot to enjoy your meal with the best view. 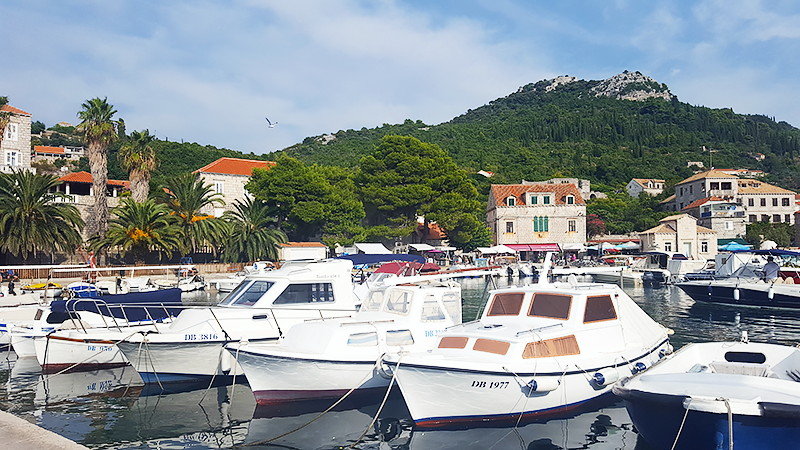 If sailing isn’t your thing, take a hike up to Park Orsula for a stunning view of Old Town and Lokrum Island. You can reward yourself with a delicious meal once you reach the top. Or, go to Dance Beach and dine on your perfectly packed snack next to the sparkling water and sunkissed rocks. If you’re looking for something different, contact Alexandra and she’ll set you up with a picnic and recommendations on where to go for a lovely afternoon. After a full day, you’ll want to take some time to rest and relax before going back out. Make dinner reservations for later in the evening so you don’t feel rushed. For a stellar seafood meal, check out Dalmatino. It’s a bit pricey but it’s worth every bite. After dinner, stop for a drink at Cele on the Stradun, then walk around Old Town before heading off to bed. It’s a wonderful time to admire your surroundings without the daytime crowds. 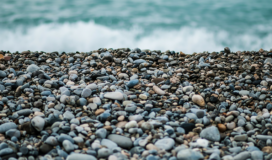 If you’d like venture out to a nearby country on day 2, plan a day trip to Montenegro or Bosnia and Herzegovina. You can’t go wrong with either location but do a bit of research to make sure which one is best for you. 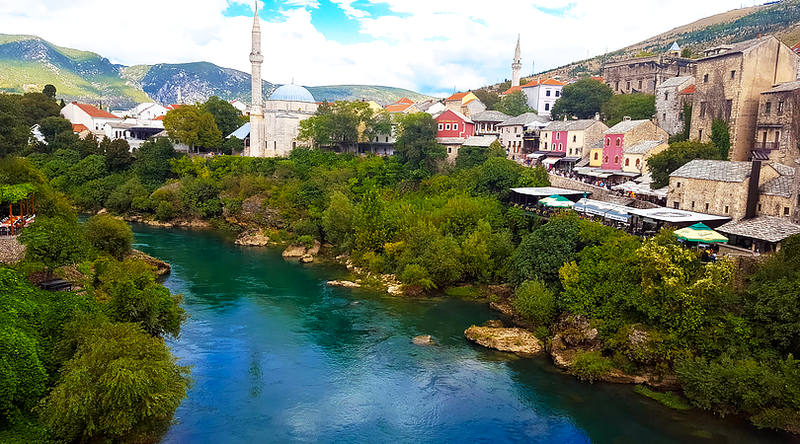 Our Experience: We visited Mostar and Pocitelj in Bosnia & Herzegovina. We chose BiH because we heard that Montenegro was very similar to Croatia and we wanted to see something a little different. There’s nothing wrong with Montenegro and we’ll be checking it out on our next trip to the Balkans! 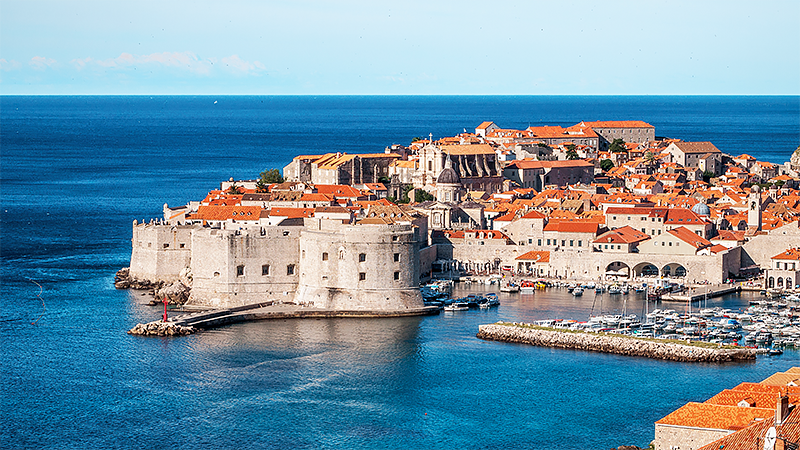 On the last full day in Dubrovnik, you’ll want to stay close to the city to see any sights you missed. So, get an early start as this will be a busy day. 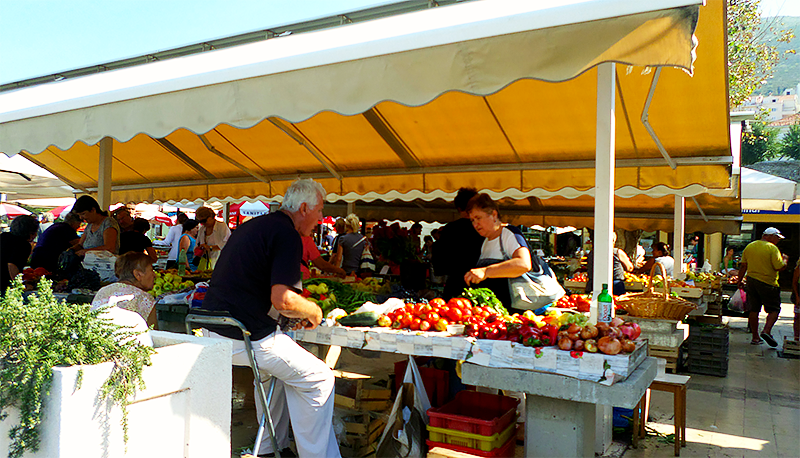 Begin the day at the farmer’s market in Gundulic Square. Pick up some fresh fruits and vegetables to carry with you as you make your way around the city. 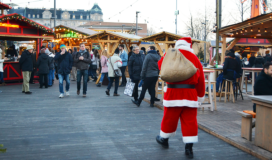 Also, grab a few local favorites like orange peels, candied almonds, and dried figs. 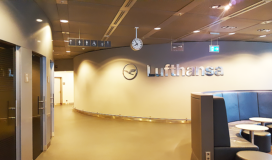 Check out the many museums in Old Town like the Museum of Modern Art, Ethnographic Museum, Maritime Museum, Cultural History Museum, and the Archaeological Museum. Also, you should make time to see the War Photo Limited exhibit which was incredible. 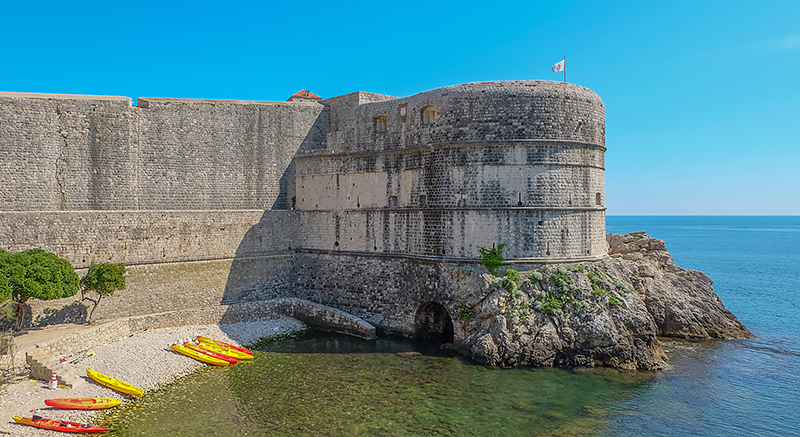 You’ll get a quick lesson, through photos, on the history of the war in Dubrovnik. It’s not to be missed. Be sure to check the website for opening dates/times. If you’d like to do more than look at art, try a walking tour. There are several offered in, and around, town. There’s no better way to learn about a city than through a guided walking tour. After checking out the museums and tours, catch up on some of the places you may have missed. You can’t leave Dubrovnik without seeing Sponza Palace, Rectors Palace, Fort Lovrijenac, St. Blaise Church, and the Monastery. Also, if you missed the Pile Gates on your way in, don’t forget to see those up close and personal. They’re quite majestic and the guards aren’t bad either. After all of that, take a moment to relax at Onofrio’s fountain and watch the world go by. If you’re not the museum type and you’re not quite ready to pack it all in, how about a little adventure? 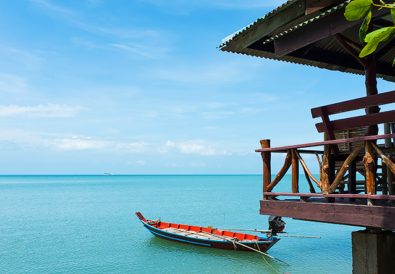 Grab a kayak or Stand Up Paddleboard and take it for a spin out on the crystal waters. Don’t forget your waterproof camera because you don’t want to miss those stunning views of Old Town from the sea. On your last evening, I would suggest dining at a local favorite, Pantarul. Although we didn’t make it to Pantarul, it was suggested by the Skipper on our sailing tour, a woman at the local market, and even a friend who works at another restaurant. I don’t think you can go wrong here! 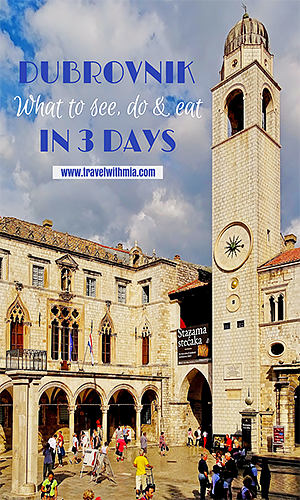 There’s so much to see, do, and eat in this city but, of course, you can’t see all of Dubrovnik in 3 days. However, there’s nothing wrong with going and making the most of the time you have. We spent 7 days there and we’re already planning a trip back to see what we missed. Don’t ever let anyone tell you that a certain number of days (even 1) is too little to visit a place. If that’s all you have, I say go! Croatia is a wonderful country and Dubrovnik is the perfect city for your wallet. 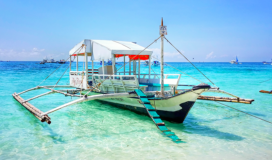 It has history, culture, beaches, and the most flavorsome food all for a reasonable price. Know before you go: Everything in Old Town (inside the city walls) is more expensive than outside the city walls but things are still affordable. That includes accommodations, food, drinks, souvenirs, etc. However, if you budget wisely, I think you could spend anywhere from $50 (and up depending on your budget) per day. If you visit nearby Bosnia & Herzegovina, you’ll flip at how affordable things are, so plan to do your shopping there if you can. If you’re looking for a great place to stay, check out the Airbnb we rented. It’s a two bedroom apartment located in the center of Old Town. It has an incredible view of Gundulic Square from one of the two bedrooms and the living room. Right outside your door are two great restaurants and just a few feet away is the famous Stradun (which runs through the heart of the city). For reference, the apartment is located right behind the St. Blaise Church. 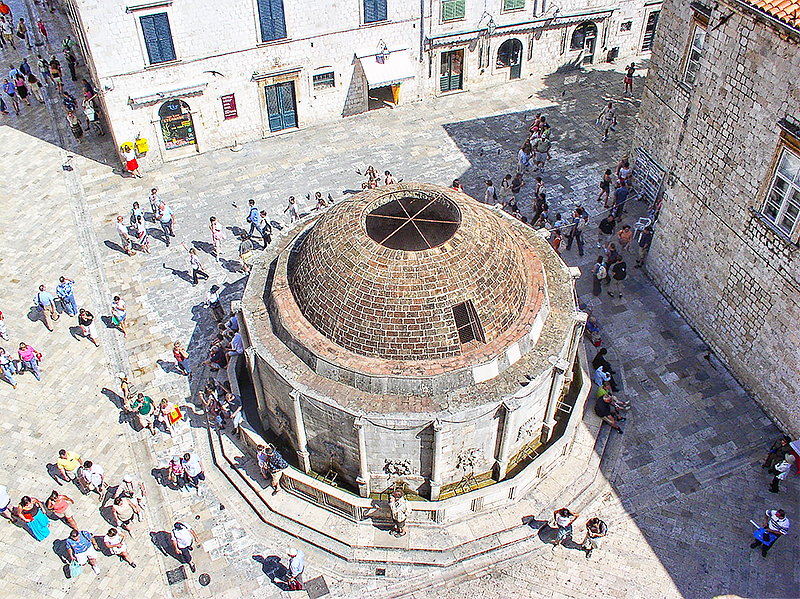 **Entrance tickets to museums and other sights were provided by the Dubrovnik Tourism Board. However, as always, all opinions are my own. Have you visited Dubrovnik? Croatia? What did you think? 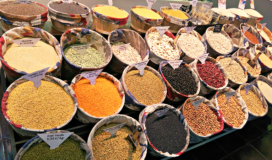 What did you see, do, and eat in Dubrovnik in 3 days? Tell me about your experience in the comments!